Looking for road-tested, practical tips for your next team or group coaching engagement? Look no further. Organizations are increasingly looking to group and team coaching processes for greater impact and cost savings, and to sustain learning initiatives which have often been weak in transfer or accountability. is need for an advanced dialogue/resource on group coaching issues, and more practical resources to support coaching work with teams. and group coaching engagements. It also expands the lens to look at the players who are involved in capacity development and coaching many—peers, coach as leader, and mentors. The book was released in late July 2013 by Jossey-Bass. It has already been selected as a resource text by several coach training schools. ​You can find the book on Amazon. It doesn't have to be "Death by Conference Call"! 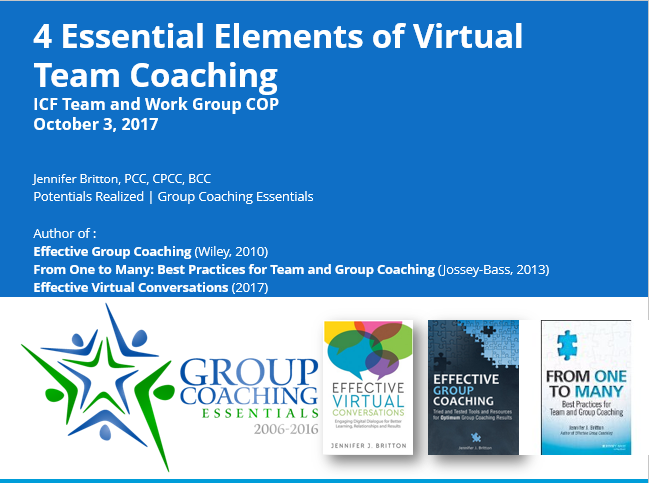 Geared for professionals who are needing to lead and create more effective virtual conversations, whether it's a webinar, a conference call or virtual team meeting, or virtual coaching session. ​The book includes practical and actionable ideas for you to try out in your upcoming virtual conversations. ​The book is 444 pages and is available in hard copy and Kindle Versions. Please check them out at Amazon. Accompanying the book is 18 templates which you can use in your own work, which book purchasers can download at our new EffectiveVirtualConversations.com website. PLooking for resources specific to Group Coaching? What is group coaching and is it right for you? What is the business case for group coaching? 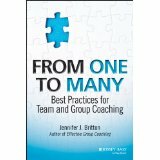 The book also includes interviews and spotlights the work of 13 exceptional coaches who are leading their own group coaching programs, including leaders in the field such as Ginger Cockerham, MCC; Mary Allen, MCC; Suzee Eibling, PCC; Eva Gregory; Ann Deaton, PhD; Victoria FittsMilgrim, PCC, CPCC; Lynda Monk, CPCC; Maureen Clarke, CPCC; Deena Kolbert, PCC, ORSCC; Jill MacFadyen, ACC; Heidi Michaels, Rita Weiss, and Marlo Nikkila. Coaches who are experienced with, and new to, group coaching, will find this book useful and immediately applicable to the work that they do. The book will also be of interest to small group facilitators, HR professionals and trainers who wish to incorporate more of a coaching approach into the work that they undertake with groups. Check out the different resources and past presentations at our Resources Page. Looking for something different to bring into your next team meeting, workshop, retreat or coaching conversation? Visual images are powerful in opening and shaping dialogue. 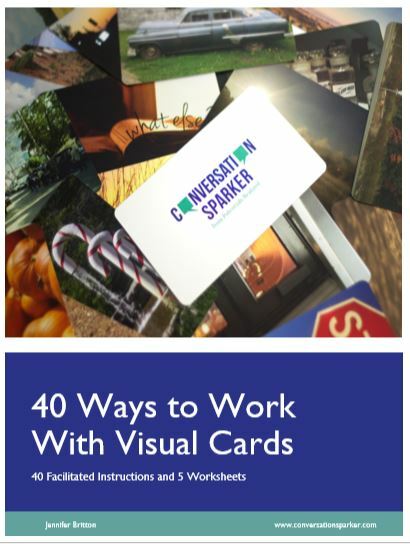 Potentials Realized is pleased to offer a 72 card visual photo deck which includes 50 photos, and 22 questions. You can learn more about these, and order a set, at ConversationSparker.com. These are very portable, about the size of a postcard. 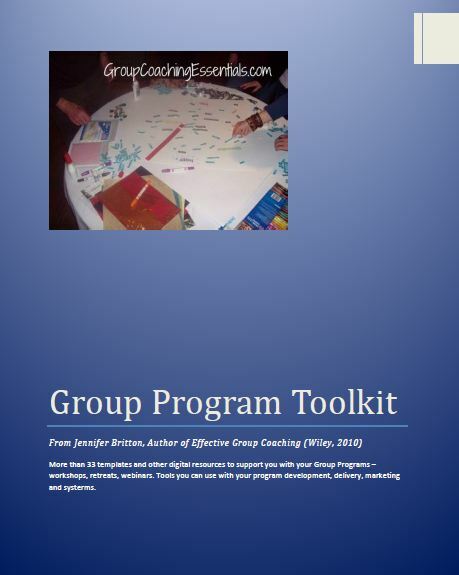 They are accompanied by an 11 page booklet providing you with several examples of how to use them with teams and groups. Cost: $69 US plus $10 postage (across North America).